When Jeff Friday traveled to his first Sundance Film Festival to catch “Love Jones” in 1997, what struck him most is what he didn’t see. “I returned from Sundance very inspired by what I saw there, but what I did not see was filmmakers of color,” said Friday. “So I came back to New York inspired to create something like it that really served as a platform for Black filmmakers.” That’s when Friday first envisioned the American Black Film Festival. Back then, the Newark, New Jersey native and Howard University alumnus – who holds an MBA from New York University – worked as a high-ranking advertising executive at the Black-owned UniWorld Group. There, he oversaw marketing campaigns targeting African-American moviegoers. Mexico’s Ministry of Tourism, a UniWorld client, loved the concept and hosted the event in Acapulco. Ninety people, including long-time supporters Bill Duke and Robert Townsend, attended that very first Acapulco Black Film Festival. Nearly 800 arrived the next year, and 3,500 attended in 2001. 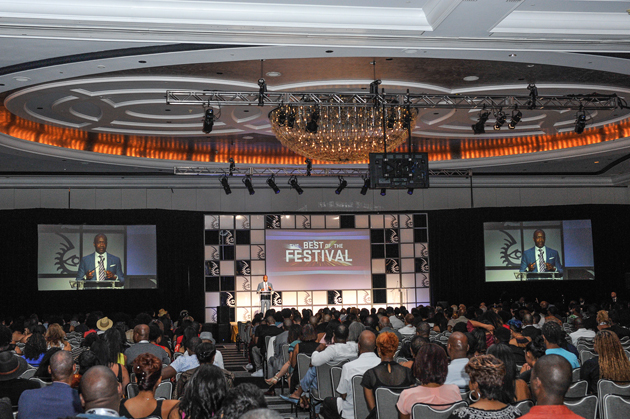 The festival moved to Miami Beach in 2002 and domesticated its name to the American Black Film Festival. From South Beach to L.A. and New York City, the site of 2015’s gathering, between 5,000 and 10,000 regularly attend. While there are many other Black-oriented film festivals, Friday’s uniquely integrates Black Hollywood veterans, new talent and numerous corporate partners. The players may change, but the festival’s primary mission never does. “This was always about empowering people of color to make movies and being a platform for supporting the next generation,” Friday said. Actress Emayatzy Corinealdi remembers this support the most. Producer Will Packer (“Uncle Buck,” “Think Like a Man”) and actor/director Nate Parker (“The Great Debaters,” “Red Tails”) are other talents whom this festival embraced early on. And they give back. At this year’s gathering, Packer hosted a “first look” for his latest film, “Almost Christmas.” Parker did the same with his highly anticipated Nat Turner slave-rebellion film, “The Birth of a Nation.” Corinealdi was a “Black Women in Hollywood” panelist. Serving the Black film community beyond the festival is very much on Friday’s mind these days. To honor Black Hollywood pioneers and welcome new talent, Friday and his team conceived the ABFF Awards as a private dinner long before the #OscarsSoWhite firestorm resulted in BET televising the affair this past February. That successful partnership led to the inaugural ABFF Encore during the 2016 BET Experience, which supports the BET Awards. Standouts included a master class with “Black-ish” creator Kenya Barris and indie pleaser “Destined” from this year’s festival. Friday is also confident that a more embracing Hollywood vanguard – like the Oscar-granting Academy of Motion Picture Arts and Sciences’ recent membership invitation to a record number of black film professionals – won’t drop the curtain on the American Black Film Festival.